then sold to Burnley for £40,000 at the end of the 1972/73 season. played before, like the true professional he was. missed out on an European place. lifting the Anglo-Scottish Cup fr the club. January 1980 he was sold to Blackpool for £25,000. relegated and had to apply for re-election to the Football League. 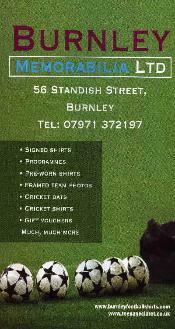 a small sports store in the Burnley Market.